As you probably know, According to TrustedReviews and many other news sources BitTorrent has been sold to Justin Sun and his blockchain startup Tron. Due to this, and because no one knows with certainty what will happen with BitTorrent, you will be wondering what is the best alternative. You came to the right place. FrostWire is one of the few fully independent, fully featured open source alternatives. 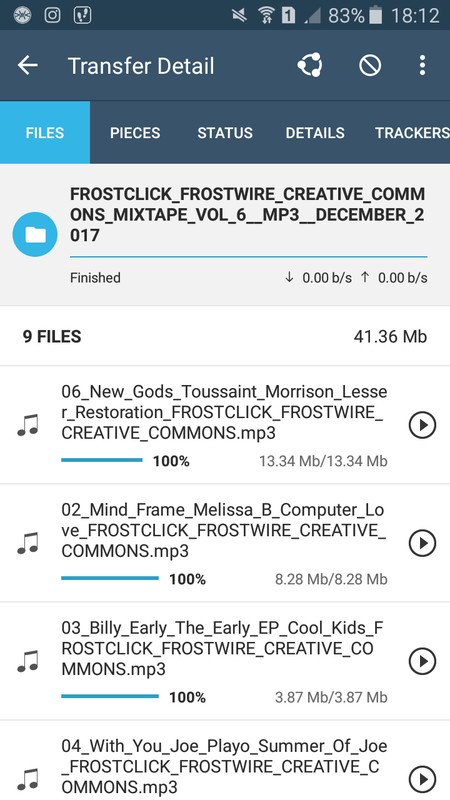 FrostWire is a free, fully featured BitTorrent Client and Cloud downloader with a built-in Music Library designed for Android, Windows, Mac, and Linux. 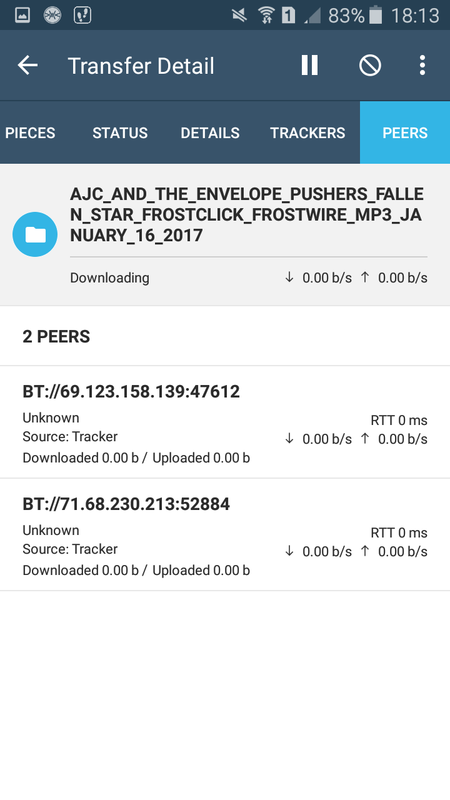 FrostWire allows you to find & download any file from the distributed peer-to-peer BitTorrent Network – music, movies, apps, ebooks, images. Any file – no matter how big or small! 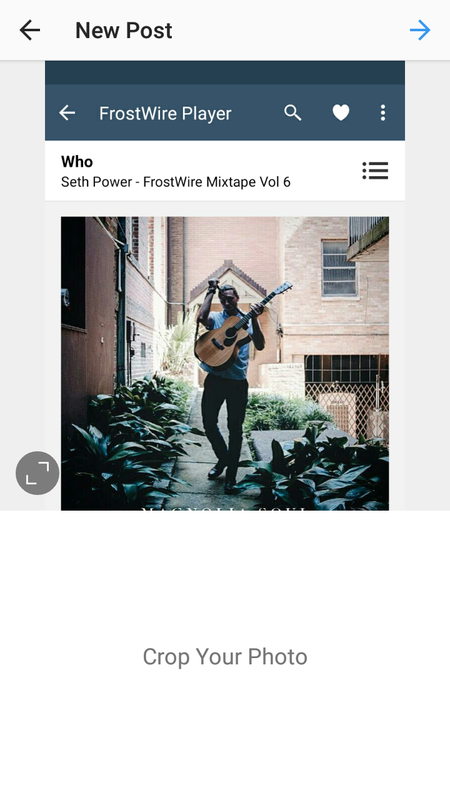 In addition, FrostWire is also a cloud downloader – fetching results and able to download files from cloud based sources such as Archive.org, SoundCloud.com and YouTube. 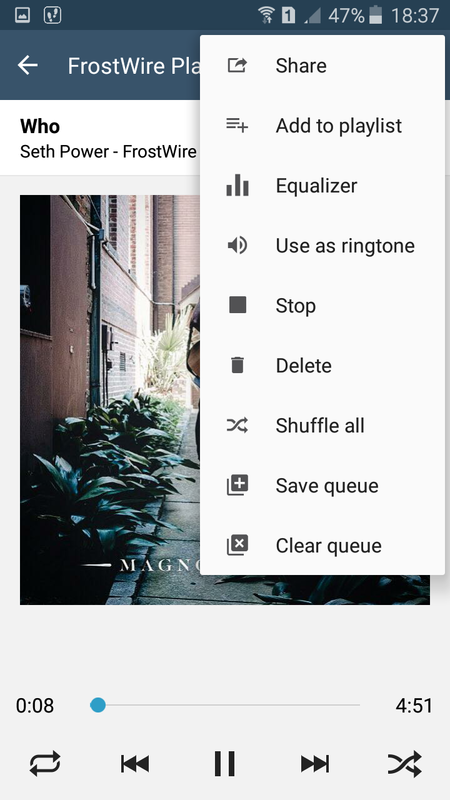 You just enter a keyword and search, then pick a file from search results and download the file with one tap. Yes. It is that easy! So, what are you waiting for? Download FrostWire for free today! Get FrostWire Plus 2.0.4. build 523! It’s the best time of the week! We invite you to get our latest release of FrostWire Plus for Android. We have optimized the app to work faster and more stable. FrostWire is a free, open source BitTorrent client first released in September 2004, as a fork of LimeWire. It was initially very similar to LimeWire in appearance and functionality, but over time developers added more features, including support for the BitTorrent protocol and a full blown media player. Get FrostWire Plus 2.0.2. build 515! Happy Friday! If you have not yet updated, we recommend to download the new version of FrostWire Plus for Android! A lot of bugs fixed, VPN detection working better, and torrent search engines working again! Get FrostWire Plus 2.0.2. build 491! Happy Monday! We’re glad to announce this pre-release of FrostWire Plus for Android. This new version includes several fixes related to search results. How to tell to your Antivirus to allow FrostWire? Have you tried to install FrosWire and your antivirus didn’t allow it? In this article we will explain you how to fix that! It’s important to know that FrostWire installer downloaded directly from our website (www.frostwire.com) or via automatic update doesn’t contain any trojans or viruses. When for some reason your antivirus flags FrostWire, here are the steps you can follow to allow your Antivirus let FrostWire run. We have done the step by step tutorials for AVG and Webroot, but the steps necessary should be similar for any antivirus on the market. 1. Download FrostWire installer from FrostWire.com and once the AVG launches an alert when trying to install FrostWire, select the option to “Allow” the app. Once there, go to Advanced settings… > Exceptions > Add exception and select the exception type Application or File so you will be able to browse your file and add the address where the file is located. The files added to the AVG exceptions shouldn’t block the installation of your app again. 1. 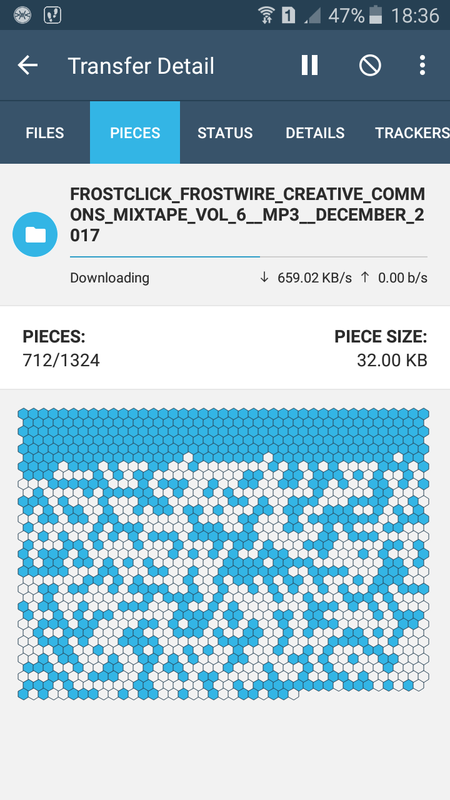 Download FrostWire installer from FrostWire.com. Do not clean up the frostwire-setup.exe file when Webroot wants to Clean it, this is the FrostWire installer, not a virus or threat. 3. When you open the Installer yet again, Webroot will show you another alert saying the file is trying to connect to the Internet. In this case select the option “Allow Always” – that will allow FrostWire to install and run properly. Click on Start > My Computer. Then, click on the View tab at the top of the window. Under Advanced Settings, locate Hidden files and folders. Select Show hidden files and folders just below that. Hidden files will now be shown. 5. Now you can see where the file marked as a threat is located and do the same you did with the installer, select the PC Security icon on the Webroot screen and select the label to Block/Allow Files. Next tap on “Add File” to select the file C:\……\ocsetuphlp.dll and click the option “Allow“. After you have completed the steps, try to open the FrostWire installer again – it should install and run with no issues. If your antivirus is marking FrostWire as Trojan, the steps to allow it are the same. The year is almost over but we are still working! To end 2017 we have decided to release FrostWire 2.0. 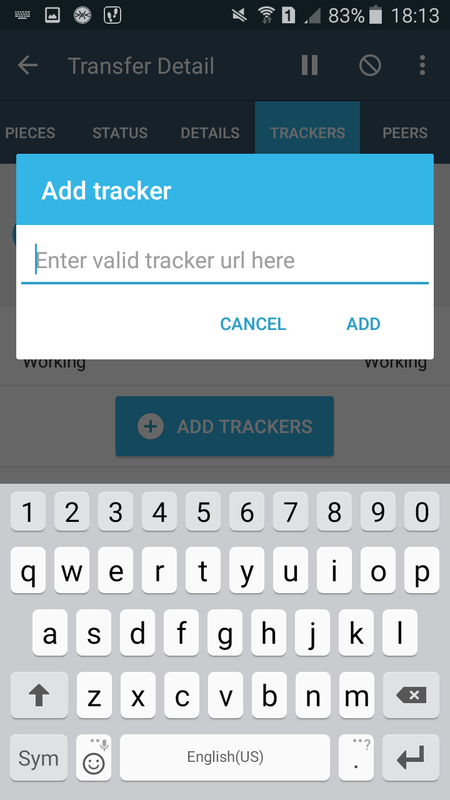 FrostWire 2.0. for Android is a major release of our app. We created a new details screens for BitTorrent transfers. You will love it! You will notice that it’s so relaxing to see how a Bittorrent swarm downloads the file pieces into our new Piece Hive view. The new transfer detail screen for BitTorrent transfers has several tabs! The first tab is Files. On Files, you can see what files are included in the torrent. You can play each file. On the tab Pieces you can see how each piece of the torrent is downloaded. Also you can see the download and upload speed of the file, the number of pieces, and the piece size. You will be fascinated to see the download process of each torrent! No other app does this! On the tab Status you can see what is the condition of the torrent at that moment. 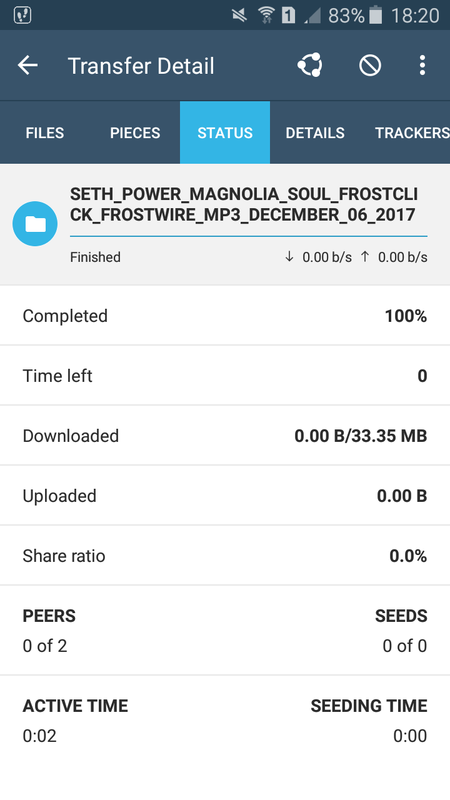 You can see the download percentage, the time it takes for it to download, how much has been downloaded and how much has been uploaded, what is the number of peers and seeds, the time of activity. It is a very detailed and complete information like no other torrent client! On the Details tab you can see where the torrent is being downloaded, the total size, the number of files, you can see the speed limit the hash number (unique for each torrent! greater security), the magnet link, and when the torrent was created. On the Trackers tab you can see the list of trackers of the torrent file, and you can also add other trackers. Very simple, very useful, very powerful! Finally, on the Peers tab you can see the number of peers of the torrent and details about from each of them. 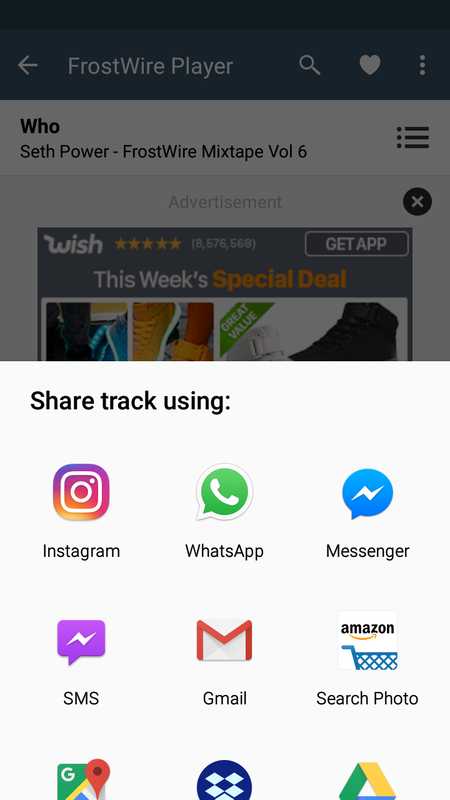 On the other hand, now when you share a track that you are enjoying on social media, Frostwire will automatically attach a screenshot of thw music player. You can always delete the attachment from your social media post if you don’t want to include it. This is very useful if you want people to know what you are listening. For example, you can share it on Instagram, Facebook, etc! Even more, FrostWire 2.0. is faster than the previous version of the app. – New Transfer Detail screens for BitTorrent transfers. Listen to FrostWire FrostClick Creative Commons Mixtape Vol. 6! That’s right! 2017 is almost over! We’ve had another amazing ride this year and we are so happy to announce FrostWire Creative Commons Mixtape Volume 6. The tracks on this year’s mixtape all come from free-to-download, Creative Commons licensed albums, so if you like what you hear, pls make sure to support the artists and spread the word. What are you waiting for? 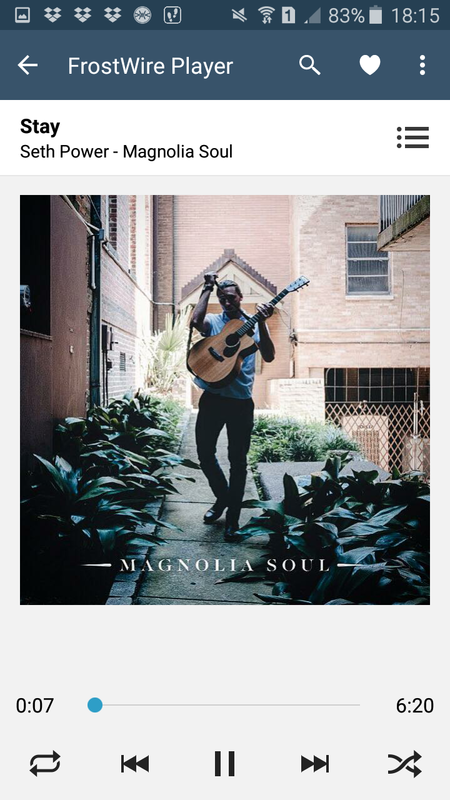 Download the torrent now! If you have a music band, remember that you can share your music on FrostClick!